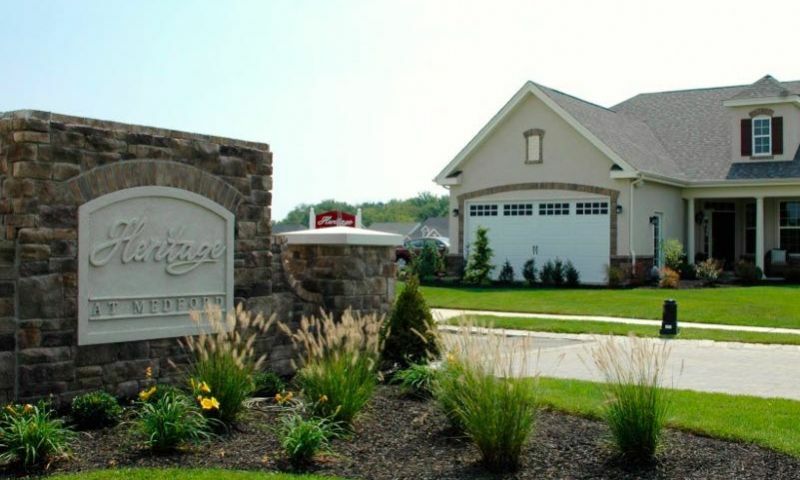 Heritage at Medford in Medford, New Jersey is a 55+ community with single-family homes built by Bob Meyers Communities. Each home is designed with active adults in mind offering low-maintenance homes with master suites on the first level. Residents will enjoy the close proximity to shopping, dining and cultural activities as well as the big-city attractions of Philadelphia, New York and Atlantic City. Once complete, residents can take full advantage of the welcoming clubhouse that will feature a fitness center and an outdoor pool. Heritage at Medford offers the perfect balance of modern amenities and historic country charm making this one of the most sought after communities in Burlington County. Residents of Heritage at Medford enjoy the inviting, friendly atmosphere within the community. The clubhouse will be the center for all social activities in the community. Whether you are looking to be physically or socially active the clubhouse will have something for you. The fitness center will be a great place to stay in shape and will offer the latest in cardio and weight training equipment. Outside, residents can take a dip in the outdoor pool or lounge on the patio. Residents will also be able to break a sweat with the walking and biking trails that weave around the community's scenic ponds. Bob Meyer Communities started development of Heritage at Medford in 2013 and upon completion there will be 228 single-family homes. New homebuyers can choose from energy-efficient single-family homes in six different models. The open floor plans are perfect for entertaining and range in size from 1,254 to 1,696 square feet. All homes feature one to three bedrooms, two or three bathrooms and one to two-car garages. Each home has the option of a fully or partially finished second floor with a variety of available layouts. Home are designed to meet individual needs and tastes to support low-maintenance living. Although there is no activities director in the community, residents of Heritage at Medford continue to develop a thriving social scene. Residents plan fun events that cater to their interests and active lifestyles. The community association covers lawn maintenance and snow removal for a monthly fee, giving homeowners more time to pursue hobbies and interests. Homeowners appreciate the laid back and carefree environment while not having to worry about the exterior maintenance of their homes. Heritage at Medford is located in Medford, New Jersey just off of Jennings Road. Residents can wander through historic Medford Village and visit the charming homes, boutique shops and well-regarded restaurants, including the famous Braddock's Tavern. With Route 295 and the New Jersey Turnpike nearby trips to Philadelphia, New York, Atlantic City and the Jersey Shore are made easy. For nature lovers, notable attractions at Medford include Freedom Park with over 100 acres of picnic pavilions and dog parks as well as the Medford Leas Arboretum which features 168 acres of natural woodlands with wildlife and walking trails. The historic area of Kirby s Mill offers unique shops, charming restaurants and seasonal festivals. Active adults in Burlington County, New Jersey will love the small town feel of Heritage at Medford. Residents of Heritage at Medford will have access to the following planned amenities. Check back soon for more information on the lifestyle in Heritage at Medford. New homebuyers can choose from energy-efficient single-family homes in four different models. The open floor plans are perfect for entertaining and range in size from 1,254 to 1,696 square feet. All homes feature one to three bedrooms, two or three bathrooms and one to two-car garages. Each home has the option of a fully or partially finished second floor with a variety of available layouts. Each home is designed to meet individual needs and tastes for low-maintenance living. The community association maintains lawns in the summer and handles snow removal in the winter, allowing you to spend more time on whats important to you. 55places.com is not affiliated with the developer(s) or homeowners association of Heritage at Medford. The information you submit is distributed to a 55places.com Partner Agent, who is a licensed real estate agent. The information regarding Heritage at Medford has not been verified or approved by the developer or homeowners association. Please verify all information prior to purchasing. 55places.com is not responsible for any errors regarding the information displayed on this website.